The etymology of the word cytometry describes its purpose. It is derived from the Greek "kytos" meaning "hollow vessel", as a cell or container and "metron" meaning measure. Historically, flow cytometry was designed for the medical field to study human cells. It has developed in the study of multicolor, functional analysis, cell cycle, apoptosis, etc… Applications have widened over the years, with an emphasis on environmental studies as well. Flow sorting now allows single-cell analyses or culturing of various kinds of cells. A high-pressure system drags the liquid sample within a sheath of fluid of equivalent density but differential pressure (lower). The pressurized system and the funnel shape of the nozzle tip create a rapid flow of sample tight enough to bring cells/particles into line. 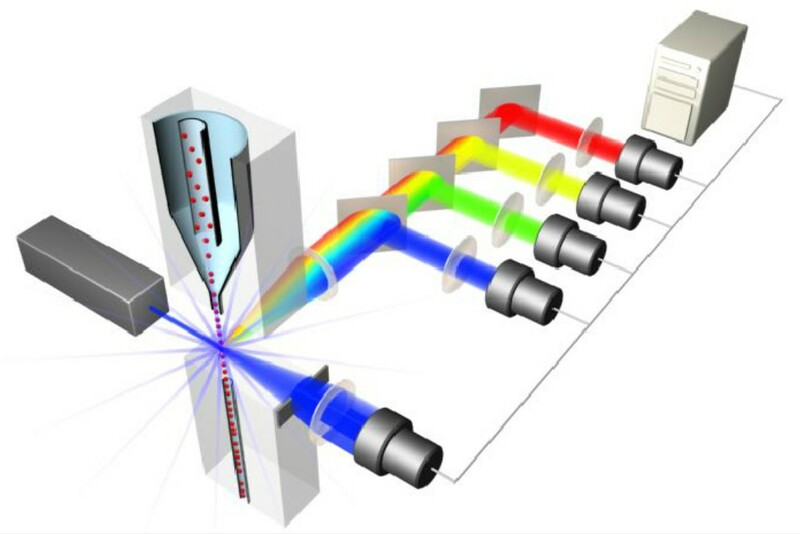 The fluid stream is hit by a laser beam and the light and fluorescence scattered by each cell is detected by filters and dichroic mirrors. 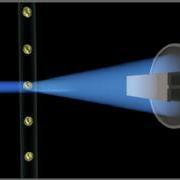 Signals are amplified through Photo Multiplicator Tubes and processed by the instrument in a very short period of time. targeted cells are discriminated and enumerated. Flow sorting involves the physical separation and collection of individualized cells of interest using an electrical charge and deviation. In the Martiny lab, we use flow cytometry to study the diversity of pico and nanoplankton. Particularly, we sort cyanobacteria from samples collected ina wide variety of marine environments for further biogeochemical or molecular analyses.